Sonic is an advanced form of drilling which employs the use of high-frequency, resonant energy generated inside the Sonic head to advance a core barrel or casing into subsurface formations. 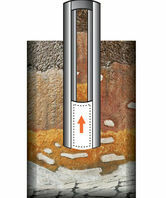 During drilling, the resonant energy is transferred down the drill string to the bit face at various sonic frequencies. Simultaneously rotating the drill string evenly distributes the energy and impact at the bit face. The resonant energy is generated inside the Sonic head by two counter-rotating weights. 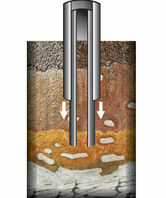 A pneumatic isolation system inside the Sonic head prevents the resonant energy from transmitting to the drill rig and preferentially directs the energy down the drill string. 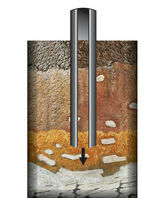 The driller controls the resonant energy generated by the Sonic head's oscillator to match the formation being encountered to achieve maximum drilling productivity. When the resonant Sonic energy coincides with the natural frequency of the drill string, resonance occurs. This results in the maximum amount of energy being delivered to the face. At the same time, friction of the soil immediately adjacent to the entire drill string is substantially minimized, resulting in fast penetration rates. 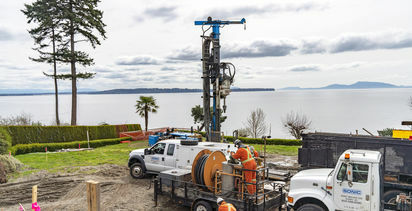 While there are several ways to drill using Sonic (depending upon site-specific conditions and project objectives), the most common means involves advancing a core barrel, which is overridden by a larger diameter drill string that cases the open bore hole and prevents collapse. After the core barrel is in place, casing is sonically advanced over the core barrel, protecting the bore hole's integrity in loose unconsolidated ground. The core barrel is retrieved, producing a relatively undisturbed sample with near 100% core recovery. Steps 1 through 3 are repeated to depth, producing a continuous core sample through unconsolidated formations with less than 1% deviation. Boart Longyear offers drilling solutions for a wide variety of applications to customers worldwide. 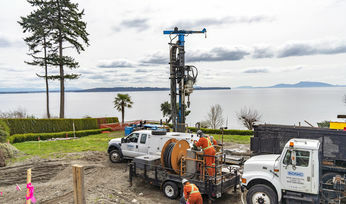 With over 129 years of drilling experience, we have the right drilling solutions for every situation.